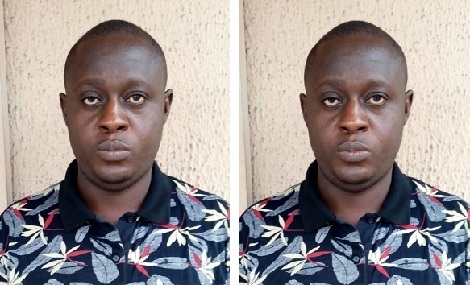 A fake Pastor, James Ezekiel has been arrested by operatives of the Economic and Financial Crimes Commission for defrauding a businessman of N1.33billion. Ezekiel deceived his victim by enlisting him as one of the “financiers” of a spurious contract in the sum of N1.8 billion. Ezekiel, who claimed to be a “Presiding Pastor of One Touch Power Ministry”, in Agudama, Epie, Bayelsa State, said he won a contract for the roofing of a cathedral belonging to the Salvation Ministries in Port Harcourt, Rivers State. He reportedly put the contract sum as N1.8billion and showed a contract award letter to his victim. He also wooed his victim to collaborate with him as one of the “financiers” of the contract. He allegedly promised the victim mouth- watering interests on his ” investment”. Ezekiel’s game unravelled when the victim demanded a repayment of his money, with interests. EFCC’s investigations showed that Ezekiel delayed making payment to his victim by deceiving him that he had been paid the sum of N800 million as mobilisation fees for the contract but could not access the funds because ” his company’s account had been frozen by the EFCC”. He also contrived a fake EFCC’s e-mail message notifying him of the freezing of the account. The victim sensed foul play and petitioned the EFCC. Further investigations showed that the Salvation Ministries did not award any contract to Ezekiel and no transfer of N800 million was made into his company’s account. Besides, the e-mail address he ascribed to the EFCC does not belong to the Commission. The suspect allegedly initiated the scam to fraudulently obtain money from the petitioner and other unsuspecting members of the public. Ezekiel is in the custody of the EFCC and would be charged to court soon.